pointing out this was “the best option” available. the July 9 rally at when he made the offer. do it on the streets. reform group’s widely publicised concession to conduct the rally in a stadium. with an “F” and the first letter of the second word starts with a “Y”. interests of a large majority,” he added. Bersih rally as well as demands for electoral reform. save you…win or lose you are dead meat. You are an embarrassment even to UMNO. intelligence to at least not trip over his own words? VC, DSO, MC, CBE….only you must add BPPM (Bodoh Punya Perdana Menteri) after all the titles you already have! anything that you might want to say to any crowd. actually said something else , is now over…finito, ended! Prime Minister of Malaysia ….and you know who they are….the end cometh! BPPM betul mangkuk punya PM and penipu. As at this moment, already 211,579 people have told Najib to shut up, on Facebook. He is sooooooo thick-skinned even if someone is shouting at him right in the face with a loud hailer. This guy is beyond redemption. UMNO comprises liars and thieves. And this PINK LIPS tops them all since he is their chief. Whilst the Mamak ex-PM still takes the cakes as the Greatest Liar and Thief in UMNO's history, the Mamak ex-PM did not have his wife as an accomplice. This PINK LIPS wins hands down as he is stupidly assisted by his dwarf missus, 1Malaysia's own "Imelda Marcos" the ever unpopular FAT ROSMAMA. PM kita ada amalkan seperti di atas? Hehehehehe, Utusan Malaysia bilang takde. Dlm internet fuyoh…..mcm-mcm ada. 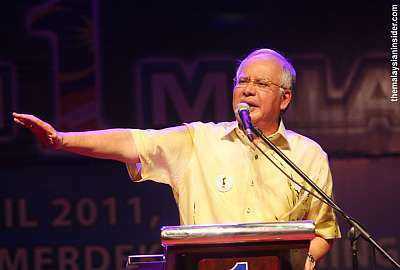 Why is he still whinning about Bersih. He lost and Bersih and the rakyat won. Just move on to your next boo-boo Najib.